Rapperswil Je zde 1 položka. "Rapperswyl". View of the city Rapperswil near by Lake of Zürich. 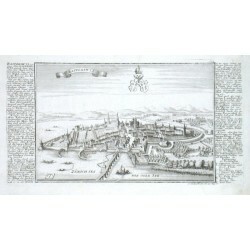 Copper-engraving by G. Bodenehr (1664-1758), printed ca. 1720. With 3 coat-of-arms and explanatory notes by the sides. 15:29,5 cm.